Provide comfort for the family of Joan Shaw with a meaningful gesture of sympathy. Joan Robinson Shaw, 85, wife of the late Richard C. Shaw, died on January 12, 2019 at Brunswick, Maine. She was born on October 1, 1933 the oldest daughter of Sara and Levi T. Robinson of Waldoboro, Maine. Joan graduated from Waldoboro High School and Gorham State Teachers College. 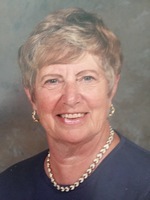 She spent 37 years teaching in Yarmouth, Westbrook, Belfast and Pittsfield. At one time Joan owned her own nursery school, Humpty Dumpty Nursery School in Belfast, Maine. She was active in church, Jaycee Wives, hospital auxiliary, a woman’s group in Pittsfield, teachers association and Delta Kappa Gamma Society. She was in “Who’s Who in America” in the sixties when she operated her own nursery school and there was a scholarship given in her honor in 2004 at MCI. She enjoyed her family very much. Joan had six wonderful grandchildren, 2 great grandchildren, her camp, travel, reading, golf, gardening and the out of doors. She is survived by her very dear life partner, Richard E. Lewis and her 6 grandchildren, Joshua Payson, Jacob Payson, Nicolas Payson, Sydney Shaw, Abigail Shaw, and Aiden Shaw, 2 great grandchildren Kinslee Payson and Quincy Payson; her sister Jean Calderwood and her brother Levi T. Robinson, Jr. Her daughter Tammy Shaw Colby and her son Randall Shaw predeceased her. Her life was blessed with all these wonderful, caring people near her. A private graveside service will be held at the Camden Cemetery in late spring. Contributions in Joan’s memory may be made to Cystic Fibrosis Foundation, 4550 Montgomery Avenue, Suite 1100N, Bethesda, MD 20814 or by going online to the office Cystic Fibrosis website. Provide comfort for the family of Joan R. Shaw by sending flowers.